Canadians, it seems, are increasingly interested in war. Our polymer currency has replaced peacekeeping imagery with the Vimy memorial. 2005 was the ‘Year of the Veteran’ and 2013 is the ‘Year of the Korean War Veteran.’ Highways, buildings, and other civic infrastructure have been proudly re-named in honour of the country’s fallen. Battles are widely celebrated as crucibles for our country’s founding. Even Remembrance Day — increasingly Remembrance Week — appears to be undergoing poppy-creep, with the red symbol worn earlier every year. Why this increased fascination with our military past? Is it a response to our recent mission in Afghanistan, or does it reflect something else, perhaps even a growing militarization of society? Last week, historians Jonathan Vance and Ian McKay put these questions to the test. Their talks, part of Toronto’s Spadina Museum conversation series, were thought provoking. 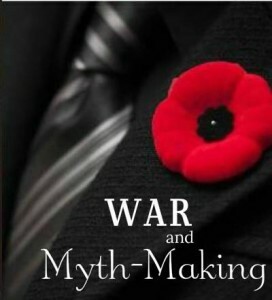 The evening, entitled “War and Myth-Making,” consisted of consecutive half-hour presentations, followed by discussion considering how Canadians mythologize war. Dr. Vance put the commemoration of war into historical context. Dr. McKay followed suit with a contemporary critique of society’s, and particularly the Harper government’s, unprecedented celebration of our martial history. The Great War figured heavily throughout the evening, as did perplexity at commemorations of the War of 1812 as a foundational moment for Canada. These were not the only wars mentioned. The Siege of Lucknow, the South African and Second World Wars, Vietnam, and Afghanistan were also discussed. How is it, many wondered, that the modern geographic and political entity we call Canada could be founded again and again and again (and only) in war? What about Confederation, the Statute of Westminster, or the Royal Proclamation? Are they not foundational moments equally worthy of commemoration? McKay explained preferences for linking our country’s founding with war as the result of the government’s open embrace of neoliberalism. Having successfully corporatized the state, the government has inadvertently killed off the last vestiges of civic loyalty and engagement. Canada’s wars, McKay argued, are the antidote. If they are kept sufficiently abstract they can stand as a pseudo-martial substitute for more meaningful civic connection to the government. This project, Vance reminds us, is very different from what communities underwent after 1914-18. Nobody today can rightly remember that war. In 1919, however, its consequences were all too real. The myth making of the interwar era was a very different project than our current endeavours. It was not abstract, but a highly personal response to the deep losses Canadian communities had endured. The resulting mythology reflected a highly conscious effort. In the 1920s Canadian society was faced with a unique problem: figuring out how to make sense of and give meaning to their war, while ensuring it remained appreciated in the future. In short, it had to imagine what future generations would forget and tailor the commemorations accordingly. These memorials remain products of their time, however forward looking their intentions. Their inscriptions invoke honour, peace, freedom, and liberty. The appeal of such sentiments is hard to argue, but they are only one part of the experience of war. Moreover, they commemorate ideals that our contemporary society finds hard to associate with the mud and destruction of the Western Front. In the case of the Great War the memorials leave out the horror, the fear, and the divisions created by that awful conflict. In the ’20s people needed no reminder of these recent hardships. But we should never forget that the sentiments selected for remembrance were different from the tragedy Canadians had endured. Those who built the monuments did so in full company of a lifetime of lived experience. These experiences are now lost, leaving only the monuments behind, creating a singular memory to the wars they commemorate. The modern project is just as selective. Unlike 1919, however, the wars commemorated today are not part of our immediate past. There is no conscious experience that recalls their pain, horror or destruction. We now have the luxury of choosing what we want to remember. Being spared the experience of a total war is something to be forever thankful. Yet, if we are serious in our calls for remembrance, our freedoms should bring with them a responsibility to work ever harder to understand the consequences and the contexts of what we remember. So, while it should come as no surprise to those gathering at monuments to past wars that these memorials now lack historical complexity, it must not be forgotten that they tell only one side of a multi-faceted story. On Tuesday night, Dr. Vance asked: can we honour the veteran without honouring the war? Like him, I do not have a clear answer, but I do recognize that studying war is different than celebrating it. As someone concerned with the impact of the Great War on Canadian society, I see the value of focusing on wars in history. They are the most destructive social and political forces, and have few equals in the ways they lay bare a society’s underlying beliefs. Yet the consequences of war are, sadly, too often over looked. To use but one example: in April 1917 the Canadian Corps captured Vimy Ridge. Four months later the Borden government passed the Military Service Act, splitting the country and, arguably, killing the prospects of the Conservatives in Quebec for nearly sixty years. For decades we have remembered the former as the site where Canada ‘came of age’. There is merit to this, but there is no denying that the commemoration of a single battle has taken precedence over the war’s long-term impact –conscription being only one of many subjects of deep historical significance long ignored (if not unknown) in public memory. If nothing else then, wars are both complex and contradictory. This is what makes the current government’s embrace of a singular, celebratory version of history so confounding. Focusing on veterans may be a safe way to remember wars. It might even make good politics. But the abstract understandings of our wars being adopted seem to do more than celebrate the veteran. It is almost celebrating the war itself, as though conflict alone can inherently give birth to a nation. This is what many find distasteful, if not outright dishonest. By rejecting the complexity of the history in question we risk misunderstanding and, more dangerously, abusing the history we are supposedly trying so hard to revere. Jonathan Scotland is a doctoral candidate at Western University. His dissertations examines the generational impact of the Great War on Canadian men. Thanks for this thoughtful post. My sense is that you’re on to something when you talk about the loss of meaning – of feeling – over time. This could be a sense of the immediacy, the costs of war. The only thing I would add is to say that the same kind of argument could be used about conscription and the Military Service Act. Historians bring up these issues now as matters of national disgrace – one divided the country between French and English, the other played with the electoral laws to skew the vote. But those at the time might make the same point you are making about war to talk of these issues too. They would have asked us to think about the real significance of the war – the costs of the front, the need for sacrifice, the need for that sacrifice to be equal. Many – in fact – most Canadians thought that both these issues were worth it. After the war, Anglo-Canadian Liberals returned to the party and benefitted from the taint of conscription which stuck to the conservatives, leaving them free to pretend that they hadn’t supported it. In reality, it was messier. I agree with you. The entire suite of legislation accompanied conscription was certainly believed to be justified at the time. Messy is a good way to describe what happened there after. What concerns me is that we seem to stop thinking about the war and its impact with 1918 or 1919, as though decisions made during the war somehow did not have consequences thereafter. Conscription is an obvious example. The listlessness of returned men is another, and almost entirely ignored. Policy makers today are perpetually concerned with the country’s economic productivity. The earning potential lost to men drifting from job to job after the war must have been substantial, but apart from studies of specific labour disputes or a general understanding of economic decline until about1923, we have little work exploring the very real consequences of the war experience. If we’re going to put a war up on a pedestal as a major nation building experience, then we need to put it in the proper perspective, messiness included.